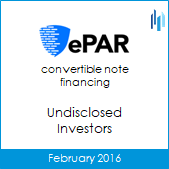 Principals of Skyline Advisors (formerly CFO Capital) served as a strategic advisor to ePAR, LLC in a $4.2 million convertible note financing. The financing will support the growth of the company’s ATS Secured platform. The terms of financing, which closed in February 2016, and the identities of the investors were not disclosed. This round follows a $3 million private placement that the company completed in July 2015. Based in Omaha, Nebraska, ePAR developed and markets proprietary software solutions that bring transparency, security, and collaboration to complex transactions. Its wholly owned subsidiary, ATS Secured, provides solutions for residential real estate transactions.